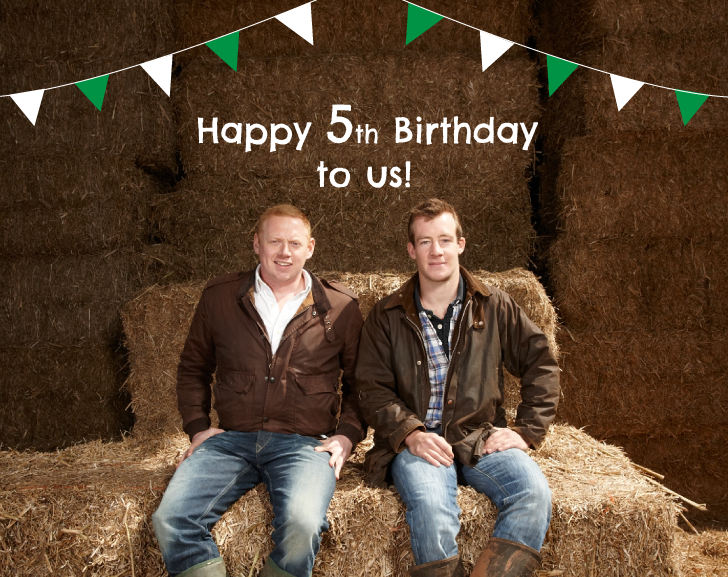 We started field&flower five years ago, although the first year was really just testing an idea rather than having a ‘real’ business. Flower worked on the farm and I had a full time job in London. We borrowed a cow from James’ dad in January 2010, put it in boxes and sold it to friends and family (they had no choice), asking them for feedback. We started the business wanting to put the field&flower word out there however we could. In the early days we actually ended up creating two businesses by accident – online retail and a pop-up catering business. The catering business began because we had forequarter beef left at the end of each month that wasn’t being sold in our beef boxes. We decided to go to food festivals and cook that week’s remaining meat as burgers and sausages. Our catering business grew quickly and we soon found ourselves catering everything from private birthday parties to music festivals such as Glastonbury. A week after our website went live in 2011 we had an enquiry from Virgin Media asking us if we’d be interested in catering the VIP area of the V festival. The thought of catering for 2000 people each day was daunting but it was too good an opportunity to turn down, even if it was our first catering job. We met Richard Branson and featured in the national press over the weekend (without our friends we never would have pulled that off!). It was a great weekend and a fun sideline but we eventually made the decision to stop as our online orders began to pick up and we knew we couldn’t sustain two different businesses. Since then we’ve focused only on sending out great quality meat to our customers’ doors. We built our first butchery ourselves and for three years we butchered every cut and packed every box, getting to know every customer and learning about why people were buying from us. As we grew, Flower decided to approach local free range farmers to supply us with lamb, pork and chicken and eventually we introduced wild game, much of which was shot by Flower in the early days! Obviously we can’t do everything any more but being hands on has been so important to our business and we want to keep it that way. Flower still personally oversees the packing of every single box we send out and I still spend my weekends at many of our food shows meeting customers. We had a lot of ups and downs in our first few years but when all of our turkeys were killed by a fox 6 weeks before Christmas one year it was clear we needed some contingency plans. Luckily we found another free range turkey farmer rearing to our standards who had enough birds for us but the prospect of ruining our loyal customers’ Christmas dinners was a stressful one! We received some really good press from The Independent, The Telegraph, Delia Online, Observer Food Monthly, The Evening Standard and Delicious Magazine which really helped us gain recognition. This sort of free promotion has been so valuable to us right from the start and we’re pleased so many journalists and writers liked what we do enough to write about it. One of the best boosts for us as we were starting out was word of mouth amongst our customers. Five years on and we’re very fortunate that this is still the case, and we’re pleased to still be sending boxes to some of our very first customers. We have a very loyal team working for field&flower for whom we are eternally grateful. Not to mention the support of our family and friends! With the people and the platform to make field&flower bigger and better, we’re really excited about the next five years… whatever lessons they may bring!